“Dad, can I run on the field?” the soon-to-be Tasered 17 year old son asked. “I don’t think you should, son,” the dad replied. The dad shook his head. But sometime in the eighth inning the son made his move anyway. He jumped the fence, bolted onto the outfield grass, and eluded two security officers before he was finally zapped with 50,000 volts in left-center field. 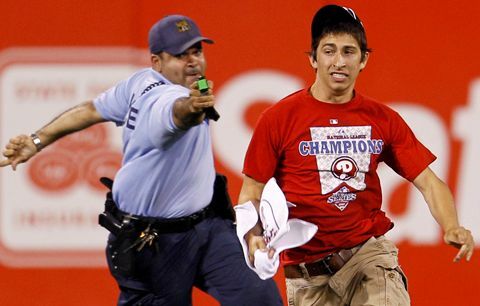 The Philadelphia security guard’s use of the Taser on the fan sparked national outrage this May. The anger was righteous. He should have tasered 44,816 more fans that were in attendance that night. Put simply, Philadelphia fans are barbarians. They are a trashy, motley breed that has booed Santa Claus. They have been known to pelt players that jilt the team with D-cell batteries. They have even cheered when opposing players get hurt. Three months after TaserGate, a Phillies fan vomited on an 11-year old girl. On purpose. 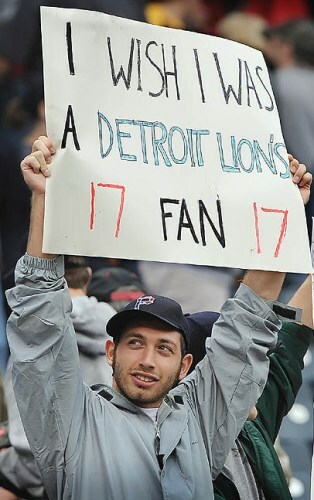 Yet his transgression was simply another day at the ballpark for the worst fan-base in America. The fans don’t deserve this. They don’t deserve Ryan Howard’s towering homeruns or Roy Halladay’s no-hitters. And they especially don’t deserve Cliff Lee. The prized jewel of free agency spurned the Rangers because they wouldn’t give him seven years. He rejected the Yankees, in part, because the team’s fans spat on his wife during the ALCS. He instead took fewer years and dollars to join Roy Halladay, Roy Oswalt, and Cole Hamels and form the greatest pitching quintet since the fabled Greg Maddux-Tom Glavine-John Smoltz-Steve Avery Atlanta Braves’ rotations of the 1990s. Meanwhile, a couple bridges over, the Pittsburgh Pirates front office was giddy for more dubious of reasons. The team had limped to 105 losses, a North American continental 18th straight losing record. Pat Maholm was their ace. He won 9 games. Joel Hanrahan was their closer. He saved 6 games. The Pirates salary was $33 million. Alex Rodriguez’ salary was $33 million. And yet, the franchise would rake in $30 million. It’s possible, under the right circumstances, Pirates GM Neal Huntington realized, to make more money with a flop baseball team than with a hit. The Pittsburgh Pirates are major league baseball’s real-life version of The Producers. Every year the front office trots out a no-name roster and pockets the luxury taxes from the New York Yankees and Philadelphia Phillies. The Pirates are not alone. The Florida Marlins netted $92 million in revenue sharing in 2008 and 2009. The cross-state Tampa Bay Rays collected $75 million over 2007 and 2008. Billionaire Mark Cuban expressed interest in buying the Pirates. He raised the lowly Dallas Mavericks to the pantheon of the NBA elite and wanted to try the same in baseball. But Commissioner Bud Selig refused, evidently preferring a cheap owner who cared nothing about the fans than a loud one who would. The tale of two Pennsylvania baseball cities is a tale of the game’s inequity. Bantam media market teams like Kansas City and Cleveland need not bother against Boston and New York heavyweights. Six teams—the Florida Marlins, Texas Rangers, Oakland Athletics, Arizona Diamondbacks, San Diego Padres and Pittsburgh—had a payroll less than the left side of the Yankee infield. Alex Rodriguez was paid by the Rangers and the Yankees this season. Nine years after signing the game’s biggest contract, six years after his last steroid injection, ARod finally led the Rangers to the AL pennant, batting an anemic .190 (4-for-21) for the Yankees in the ALCS. ARod and the Yankees’ other overpaid bats were stifled by Cliff Lee and the rest of the Texas Rangers’ rotation. The Rangers torrid bats were, in turn, cooled by Tim Lincecum and the sterling San Francisco Giants rotation. A fitting send off to the Year of the Pitcher. Six pitchers twirled no-hitters. 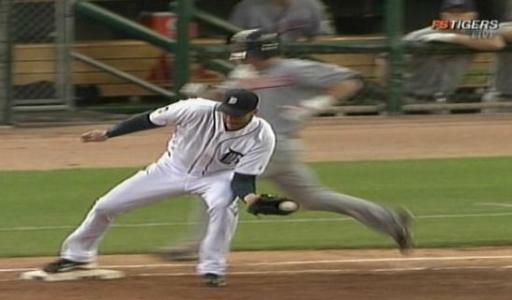 It was seven to everyone but first base umpire James Joyce who blew the call on a routine groundball that robbed Detroit Tigers pitcher Armando Galarraga of a perfect game. 2010 saw the fewest homeruns per game since 1993. Batting average, hits and ERA drooped to their lowest levels since 1992. The culprits? Pitchers huddle over game-tape more than ever to decipher batters’ tendencies, the San Francisco Giants starting rotation, and the game is cleaner now. 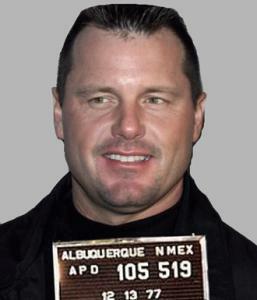 Indeed, the faces of baseball yesteryear are the mug-shots of today. Barry Bonds’ 7 MVP titles are now overshadowed by 10 counts of false statements and 1 of obstruction justice. Roger Clements was indicted on perjury charges for lying to Congress and faces prison time. Regardless of whether or not they are convicted in court, they have already lost the court of public opinion. Mark McGwire and Alex Rodriguez opted for the troubled Hollywood diva PR strategy. They set up elaborate press conferences and tearfully confessed to fans and kids everywhere that they were frauds. That their records were the work of HGH, not hard work. Their Asterixed achievements are celebrated (however awkwardly) in their home parks. Their lasting legacy on the game is not awed reverence but hardened skepticism. When the Toronto Blue Jays outfielder Jose Batista mashed 54 homeruns this season—more than double his career best—reporters murmured he must be on the Juice. Batista was left to fend off the unfortunate stigma of the Bonds, McGwire, and Sammy Sosa Era: if it sounds too good to be true, it probably is. Nowadays, the drugs of the game’s superstars are recreational, not anabolic. Giants fans chant “Let Timmy smoke!” after their ace Tim Lincecum was cited with marijuana possession last offseason. Slugger Josh Hamilton drank and snorted through his $4 million signing bonus. The Rangers celebrated their World Series berth, not with champagne, but Canada Dry out of respect for Hamilton’s past temptations. This is part one of a two part series. Check back next week for the second part. More or less I don’t read drug wherefore blogs….